Perhaps the biggest news of last week was the agreement to postpone Brexit until 31st October. Financial markets did, however, seem to have priced in the outcome entirely, and Sterling did not react strongly to the news. either the ECB April meeting nor the publication of the minutes from the Fed’s March meeting shed much light on the mindset of either central bank. The mild improvement in economic news out of the Eurozone buoyed European currencies, and the prospects of a US-China trade deal buoyed most emerging market currencies. This week the critical April PMI surveys of business activity for the Eurozone come out on Thursday. With mostly second tier data out of the US and Brexit on temporary hold, we would expect most G10 FX volatility to be seen in reaction to this data. Theresa May agreed with the EU to extend the Brexit deadline to the end of October, which would ensure the UK participates in the European Elections in May. This week, we expect economic data to finally receive some attention now that the Brexit issue is temporarily postponed. Tuesday's labour report and Wednesday's inflation data will give us some key, albeit lagged insight into how well the UK economy is navigating the uncertainty surrounding Brexit. The absence of any meaningful policy announcements at the ECB’s April meeting provided a badly needed boost for the Euro. Although communications from the central bank had a distinctly dovish tilt, it seems that for now, no news out of the Eurozone means good news for the Euro. 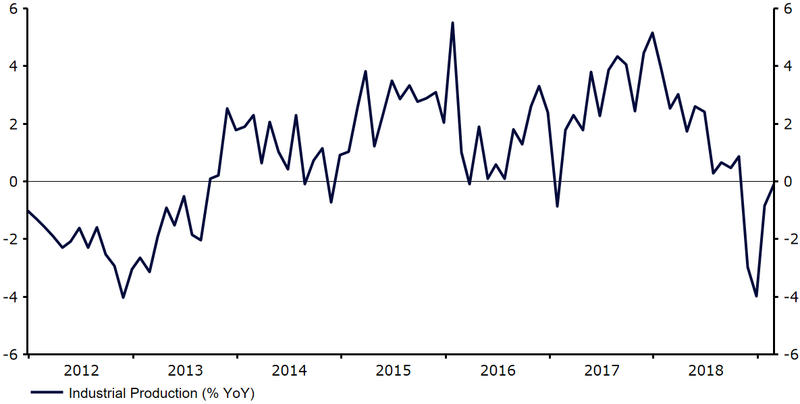 The common currency also took some comfort from better-than-expected industrial production data, albeit this continued to remain in negative territory year-on-year (Figure 1). Thursday's flash PMI data for April seems particularly critical to us. We expect them to surprise to the upside, confirming that the slowdown in industrial production is due mostly to one-off factors that are now clearing up. The release of the minutes from April's Federal Reserve meeting did little to explain the sharp dovish turn in Fed thinking since late last year. Members remain puzzled by quiescent inflation - the modest downward surprise in March CPI numbers published last week will not help them. The Fed remains on hold for the foreseeable future. The combination of steady worldwide growth and low rates in developed countries is a potent mix for an emerging market currency rally.